Man. Fl. Bras. in.2:78. 1878. Pothos violacea Swartz, Prodr. 32. 1788. TYPE: Jamaica, Swartz s.n. (not seen). Anthurium violaceum (Swartz) Schott, Mclct. 22. 1832. TYPE: Swartz s.n. (not seen). Anthurium violaceum forma latifolia Kunth, Enum. PI. 3: 68. 1841. TYPE: (not seen). Anthurium violaceum forma angustifolia Kunth, Enum. PI. 3: 68. 1841. TYPE: (not seen). Anthurium dolosum Schoti, Oesterr. Bot. Z. 8: 179. 1858. TYPE: Guatemala. Near San Pedro and San Lucia, Wendland 273 (GOET, hololectotype; K, isolectotype; here designated). Anthurium rigidulum Schott, Oesterr. Bot. Z. 8: 180. 1858. TYPE: Costa Rica. San José, Hoffmann 508 (Photo of Schott Aroid Drawing #270, NYBG Neg. #N.S. 3807). Anthurium virgosum Schott, Oesterr. Bot. Z. 9: 100. 1859. TYPE: Brazil. Río de Janeiro, Riedel (K). Epiphytic creeper; stems usually less than 1 m long; roots numerous along stem, ca. 3 mm diam., gray-green; cataphylls 3-6 cm long, drying brown, weathering to reticulate fibers and persisting around stem. primary lateral veins 3-10 per side (sometimes more), departing midrib at 35°-40° angle, weakly sunken above, ± obscure above and below; collective vein arising from the base, extending straight to apex, 3-5 mm from the margin. 2-3 flowers visible in either spiral; lepals semiglossy, lateral tepals ca. 1.2 mm wide, the inner margin weakly concave to ± straight; pistil greenish-white, scarcely emergent; stigma brush-like, cxscrtcd, ca. 0.2 mm long; stamens emerging in a prompt and complete sequence from the base, held at edge of tepals and inclined over pistil; anthers white; thecae ovate, somewhat divaricate; pollen white. INFRUCTESCENCE spreading, the spathe persisting; spadix 2.5-3.5 cm long, to 7 mm diam. 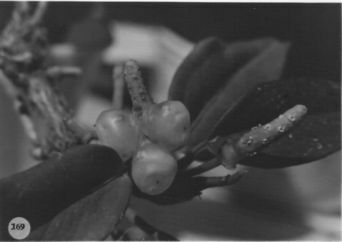 ; berries usually pale violet to almost white, sometimes purple, obovoid, rounded at apex, 5-8 mm wide; seeds 1 or 2 per locule, pale yellow, ovoid, ca. 2 mm long, 1 mm wide. Fig. 169. Anthurium scandens is known from southern Mexico and the West Indies to southern Brazil, ranging from sea level to 2,700 m. This is the most widespread aroid in the New World and, doubtless, the most ecologically diverse as well, occurring in tropical moist, premontane wet, tropical wet, premontane rain, and lower montane rain forest life zones. The species is a member of section Tetraspermium and is distinguished by its more or less scandcnt habit, elongate internodes with usually persistent cataphylls, usually oblong-elliptic, glandular-punctate blades, reflexed green, more or less ovate spathe, cylindroid, usually pale green spadix, and pale lavender to almost while berries. According to Sheffer et al. (1980), the great variability in the species is due al least in part to the fact that it represents a polyploid complex containing diploids, letraploids, and hepla-ploids. The cytology of the group is insufficiently known, so it is not certain whether the different ploidy levels are correlated with morphological variation. The species is closely related to A. trinerve, with which it has long been confused. The differences separating the two species are outlined in the key. Anthurium scandens is most easily distinguished by its spathe, which is reflexed at anthesis, whereas the spathe of A. trinerve is persistently erect even after anthesis. Belize Cayo:, June-July 1936, Lundell 6214 (MICH). Belize Toledo: 700-750 m, 16.23.22N 89.08.10W, 13 April 1992, Bruce K. Holst 4396 (MO). Belize Toledo: 940 m, 16.24.02N 089.06.40W, 19 February 1997, Thomas Hawkins 1480 (CM, MO). Belize Toledo: 420 m, 16.28.25N 088.59.43W, 21 May 1997, Gerrit Davidse & D.L. Holland 36650 (BRH, CM, MO). Costa Rica Alajuela: 1000 m, 10.08.20N 84.15.00W, 16 enero 1987, Gerardo Herrera Ch., Gina Umaña y Rafael Chacón 408 (MO). Costa Rica Alajuela: Reserva Biológica Monteverde, 900 m, 10.18N 84.44W, 22 Mar 1990, Bello 2028 (MO, CR). Costa Rica Cartago: 1350 m, 09.47N 83.48W, 29 Sep 1984, Michael Grayum 3933 (MO). Costa Rica Heredia: W 1830 m, 10.11.50N 84.06.35W, 7 noviembre 1986, Gerardo Herrera Ch. 244 (MO). Costa Rica Puntarenas: 1600-1700 m, 10.20N 84.50W, 10 Oct. 1985, William A. Haber ex Eric Bello 3394 (MO). Costa Rica Puntarenas: 1450 m, 10.20N 84.50W, 11 JUN 1986, William A. Haber ex Eric Bello C. 5046 (MO). Costa Rica Puntarenas: 1550 m, 10.20N 84.50W, 5 JUL 1986, William A. Haber & A. Clagget 5214 (MO). Costa Rica Puntarenas: Monteverde, 1500 m, 10.18N 84.48W, 26 Apr 1993, Ingram & Ferrell-Ingram 1862 (MO). Costa Rica Puntarenas: 2500-2800 m, 9.01.30N 82.49.00W, 9 Mar 1984, G. Davidse, L.D. Gómez, G. Herrera, C.R. Chacón, I. & A. Chacón 25498 (MO). Costa Rica Puntarenas: Cordillera de Tilarán, 1100 m, 10.16.20N 84.49.30W, 4 June 1993, Zobeida Fuentes 345 (CR, F, MO, NY). Guatemala Baja Verapaz: Mun. Chilasco, 1700 m, 15.8N 90.7W, 24 July 1988, Tenorio et al. 14851 (MO). Honduras Atlántida: 80-150 m, 15.42N 86.51W, 09 May 1993, Ronald L. Liesner 26101 (MO). Honduras Atlántida: 80-150 m, 15.42N 86.51W, 09 May 1993, Ronald L. Liesner 26116 (MO). Honduras Comayagua: 600 m, 14.42N 79.58W, 10 May 1991, Davidse 34335 (MO). Honduras Cortés: Montana de La Nieve, 1200-1500 m,, 23 Feb. 1982, Nelson et al. 8100 (MO). Honduras Francisco Morazán: 1800 m,, 29 Oct. 1995, Linares , J. 1873 (MO). Honduras Intibucá: 810 m,, 6 June 1985, Tellez & Martínez 8695 (MO). Honduras La Paz: 2000-2100 m, 14.08N 87.52W, 22 May 1993, Ronald L. Liesner 26432 (MO, TEFH). Honduras Lempira: Celaque, 14.33N 88.39W, 23 May 1991, Gerrit Davidse & Ramón Zúniga 34548 (MO). Honduras Olancho: Municipio San Estebán, 440 m, 15.25.25N 85.34.45W, 3 July 1994, Gerrit Davidse, Mario Sousa S. & José L. Linares 35568 (MO). Honduras Santa Bárbara: 630 m, 14.53N 88.00W, 02 June 1993, Ronald L. Liesner 26749 (MO). Honduras Yoro: Cordillera Nombre de Dios, 250-350 m, 15.30N 87.26W, 15 May 1991, Davidse et al. 34392 (MO). Honduras Yoro: 200-300 m, 15.29N 87.27W, 22 April 1994, A.E. Brant & Donald Hazlett 2899 (MO, TEX, WIS). Mexico Chiapas: 1980 m,, 21 Oct 1988, Breedlove 70564 (CAS). Mexico Chiapas: Mpo. La Trinitaria, 1230 m,, 7 Nov 1988, Breedlove & Daniel 71235 (CAS). Mexico Chiapas: Mpo Ocozocoautla, 880 m,, 6 June 1988, Breedlove 68996 (CAS). Mexico Chiapas: Mpo. La Trinitaria, 1230 m,, 15 May 1988, Breedlove & Bourell 68028 (CAS). Mexico Chiapas: Mpo. Motozintla, 2220 m,, 30 May 1988, Breedlove 68783 (CAS). Mexico Chiapas: 1000 m, 16.53N 92.15W, 15 Feb. 1987, Thomas B. Croat & Dylan P. Hannon 64913 (MO). Mexico Chiapas: Mun. San Cristobal de Las Casas,, 15 Nov. 1986, Ton & Lopez 9496 (MO). Mexico Oaxaca: Mpio. San Jeronimo Coatlan, 1250 m, 16.10N 96.58W, 17 Jan. 1988, Campos V., A. 1012 (MO). Mexico Tabasco: 150 m, 17.33N 92.59W, 19 Feb. 1987, Thomas B. Croat & Dylan P. Hannon 65342 (MO). Mexico Veracruz: El Mirador, 1200 m,, 23 Aug. 1977, Thomas B. Croat 44011 (MO). Mexico Veracruz:, , Schnee V (MEXU). Mexico Veracruz:, , Chazaro 771 (JAL). Mexico Veracruz:, , Lot et al. 1815 (MEXU). Mexico Veracruz:, , Dorantes 1800 (MICH, MO). Mexico Veracruz:, , Zola & Baker 98 (XAL). Mexico Veracruz:, , Matuda 1411 (MEXU, MICH, MO). Mexico Veracruz:, , Gonzales 856 (MEXU, MICH). Mexico Veracruz:, , Sousa 19 (MEXU). Mexico Veracruz:, , Lundell & Lundell 12532 (MICH). Mexico Veracruz:, , Matuda S-150 (MICH). Mexico Veracruz:, , Matuda 838 (MEXU, MICH). Mexico Veracruz:, , Miranda 620 (MEXU). Mexico Veracruz:, , Miranda 4836 (MEXU). Mexico Veracruz:, , Rowell et al. 17M663 (MEXU). Mexico Veracruz:, , Rzedowski 18895 (MEXU, MICH). Mexico Veracruz:, , Beaman 5296 (MEXU). Mexico Veracruz:, , Moore & Bunting 8854 (BH). Mexico Veracruz:, , Ventura 5421 (MICH). Mexico Veracruz:, , Kerber 293 (MICH). Mexico Veracruz:, , Kerber 294 (BR). Mexico Veracruz:, , Lot 537 (XAL). Mexico Veracruz:, , Dorantes 3002 (XAL). Mexico Veracruz:, , Dorantes 3088 (MEXU). Mexico Veracruz:, , Valdivia 113 (MEXU, MO). Mexico Veracruz:, , Valdivia 225 (MEXU, MO). Mexico Veracruz:, , Valdivia 439 (MEXU, MO). Mexico Veracruz:, , Valdivia 952 (MEXU, MO). Mexico Veracruz:, , Valdivia 1048 (MEXU, MO). Mexico Veracruz:, , Valdivia 1404 (MEXU, MO). Mexico Veracruz:, , Valdivia 1567 (MEXU, MO). Mexico Veracruz:, , Valdivia 1615 (MEXU, MO). Mexico Veracruz:, , Valdivia 382 (XAL). Mexico Veracruz:, , Valdivia 1127 (MO). Mexico Veracruz:, , Valdivia 1217 (MEXU). Mexico Veracruz:, , Valdivia & Matuda 517 (XAL, MO). Mexico Veracruz:, , Valdivia & Matuda 1099 (XAL). Mexico Veracruz:, , Barkley et al. 2600 (MEXU, MICH). Mexico Veracruz:, , Boege 2058 (MEXU). Mexico Veracruz:, , Dorantes 124 (BR, MO, XAL). Mexico Veracruz:, , Sousa 4844 (MEXU). Mexico Veracruz:, , Vazquez 703 (XAL). Mexico Veracruz:, , Ventura 7153 (DS, MICH, MO). Mexico Veracruz:, , Beaman 5451 (MEXU). Mexico Veracruz:, , Moore 6211 (BH, UC). Mexico Veracruz:, , Yanez 538 (F). Mexico Veracruz:, , Kennedy & Howitz 3677 (MICH, MO). Mexico Veracruz:, , Trigos 88 (MEXU). Mexico Veracruz:, , Trigos 160 (XAL). Mexico Veracruz:, , Beaman 6411 (F, XAL). Mexico Veracruz:, , Sousa 2419 (MEXU). Mexico Veracruz:, , Beutelspacher s.n. 15/3/69 (MEXU). Mexico Veracruz:, , Hernandez & Trigos s.n. (MEXU). Mexico Veracruz:, , Gomez-Pompa & Nevling 1144 (XAL). Mexico Veracruz:, , Valdivia 2112 (XAL). Mexico Veracruz:, , Gomez-Pompa & Riba 161 (MEXU). Mexico Veracruz:, , Gomez-Pompa 1838 (MEXU). Mexico Veracruz:, , Galeotti 6052 (BR). Mexico Veracruz:, , Purpus 5764 (MO, UC). Mexico Veracruz:, , Santos 3680 (MICH). Mexico Veracruz:, , Valdivia 2141 (XAL). Nicaragua Boaco: 800-900 m, 12.24N 85.33W, 29 agosto 1981, Pedro P. Moreno 10539 (MO). Nicaragua Boaco: 1000 m, 12.37N 85.43W, 11 febrero 1983, Pedro P. Moreno 20166 (MO). Nicaragua Boaco:, 11 mayo 1982, Juan C. Sandino 2855 (MO). Nicaragua Esteli: 1200-1250 m, 12.59N 86.21W, 26 May 1981, Moreno, P. and Henrich, J. 8735 (MO). Nicaragua Esteli: 840-860 m, 13.08N 86.20W, 20 Feb. 1982, Moreno, P. 15335 (MO). Nicaragua Esteli: 1000-1040 m, 12.59N 86.17W, 06 Mar. 1982, Moreno, P. 15717 (MO). Nicaragua Esteli: 1300-1320 m, 13.29N 86.21W, 13 Apr. 1981, Moreno, P. 8091 (MO). Nicaragua Esteli: Cerro Quiabu, 1440-1500 m, 13.07N 86.26W, 14 Apr. 1981, Moreno, P. 8196 (MO). Nicaragua Esteli: Cerro Quiabu, 1440-1500 m, 13.07N 86.26W, 14 Apr. 1981, Moreno, P. 8207 (MO). Nicaragua Esteli: Laguna Miraflores, 1240-1260 m, 13.16N 86.16W, 14 Apr. 1981, Moreno, P. 8226 (MO). Nicaragua Esteli: 1300 m, 13.13N 86.14W, 17 septiembre 1982, Pedro P. Moreno 17480 (MO). Nicaragua Esteli: 1360-1400 m, 13.14N 86.14W, 17 septiembre 1982, Pedro P. Moreno 17563 (MO). Nicaragua Esteli: 1200-1300 m, 13.16N 86.19W, 1 abril 1983, Pedro P. Moreno 21235 (MO). Nicaragua Esteli: 1100-1300 m, 13.14N 86.16W, 29 May 1985, Gerrit Davidse, A. Grijalva, M. Sousa & P. Moreno 30608 (MO). Nicaragua Esteli: 1460-1480 m, 13.06N 86.25W, 2 Julio 1982, P.P. Moreno 16787 (MO). Nicaragua Granada: 700-800 m, 11.49N 85.58W, 10 Mar. 1982, Sandino, J. C. 2484 (MO). Nicaragua Granada: Volcán Mombacho, cutirre, 260-300 m, 11.50N 85.56W, 11 May 1981, Moreno, P. and Henrich, J. 8432 (MO). Nicaragua Granada: Volcán Mombacho, Cutirree, 290-300 m, 11.49N 85.56W, 29 Jan. 1981, Moreno, P. 6297 (MO). Nicaragua Granada: 800-850 m, 11.49N 85.56W, 13 mayo 1982, J.C.Sandino y H.Quant 2931 (MO). Nicaragua Jinotega: 1250-1300 m, 13.15N 86.15W, 10-11 June 1981, James E. Henrich & W.D. Stevens 323 (MO). Nicaragua Jinotega: Cerro Kilambe, 1500-1665 m, 13.34N 85.41W, 28 Mar. 1981, Moreno, P. 7808 (MO). Nicaragua Jinotega: Cerro Kilambe, 800-1000 m, 13.34N 85.40W, 24 Mar. 1981, Moreno, P. 7382 (MO). Nicaragua Jinotega: Cerro Kilambe, 700-900 m, 13.35N 85.40W, 24 Mar. 1981, Moreno, P. 7434 (MO). Nicaragua Jinotega: Cerro Kilambe, 600-900 m, 13.37N 85.40W, 26 Mar. 1981, Moreno, P. and Sandino, J. 7579 (MO). Nicaragua Jinotega: 1200-1400 m, 13.15N 85.41W, 13-18 January 1979, W.D. Stevens 11289 (MO). Nicaragua Jinotega: 1200-1330 m, 13.15N 85.42W, 16 January 1979, W.D. Stevens 11486 (MO). Nicaragua Jinotega: 1200-1400 m, 13.15N 86.10W, 25 October 1979, W.D. Stevens & A. Grijalva 15167 (MO). Nicaragua Jinotega: 1200-1400 m, 13.15N 86.10W, 25 October 1979, W.D. Stevens & A. Grijalva 15210 . Nicaragua Madriz: Cerro Volcán Somoto, 1300-1500 m, 13.26N 86.35W, 15 Feb. 1981, Moreno, P. 6902 (MO). Nicaragua Madriz: 1400 m, 13.26N 086.35W, 24 septiembre 1980, P.P. Moreno 2847 (MO). Nicaragua Madriz: 1400 m, 13.19N 86.38W, 4 enero 1982, P.P.Moreno 14220 (MO). Nicaragua Madriz: 1300-1400 m, 13.18N 86.36W, 4 enero 1982, P.P.Moreno 14339 (MO). Nicaragua Matagalpa: 800-820 m, 12.59N 85.51W, 13 febrero 1981, P.P. Moreno 6620 (MO). Nicaragua Matagalpa: Camino a Aranjuez, 1000-1400 m,, 21 Feb 1980, M. Araquistain & J.C. Sandino 1406 (MO). Nicaragua Matagalpa: 1040-1100 m, 12.58N 85.52W, 05 Mar. 1982, Moreno, P. 15679 (MO). Nicaragua Matagalpa: 360-400 m, 13.03N 85.45W, 6 mayo 1982, Doribel Castro 2586 (MO). Nicaragua Matagalpa: 920-940 m, 13.01N 85.51W, 25 febrero 1982, Doribel Castro 2468B (MO). Nicaragua Matagalpa: 1000 m, 12.57N 85.51W, 5 agosto 1981, Pedro P. Moreno 10231 (MO). Nicaragua Matagalpa: 740-760 m, 12.56N 85.52W, 4 agosto 1981, Pedro P. Moreno 10326 (MO). Nicaragua Matagalpa: 900-1000 m, 12.52N 85.55W, 5 octubre 1982, Pedro P. Moreno 17714 (MO). Nicaragua Matagalpa: 1000-1200 m, 12.58N 85.55W, 22 febrero 1983, Pedro P. Moreno y W. Robleto 20385 (MO). Nicaragua Matagalpa: 980-1100 m, 12.58N 85.54W, 22 febrero 1983, Pedro P. Moreno y W. Robleto 20444 (MO). Nicaragua Matagalpa: 1250-1300 m, 12.58N 85.52W, 23 octubre 1982, Pedro P. Moreno 18135 (MO). Nicaragua Matagalpa: 1200-1540 m, 13.00N 85.55W, 23-25 May 1985, Gerrit Davidse, A. Grijalva & Mario Sousa 30377 (MO). Nicaragua Matagalpa: 1060-1100 m, 12.58N 85.55W, 8 Julio 1982, P.P. Moreno 16843 (MO). Nicaragua Matagalpa: 960-1000 m, 12.40N 85.43W, 25 January 1979, W.D. Stevens 11827 . Nicaragua Nueva Segovia: 600-640 m, 13.44N 86.04W, 26 diciembre 1981, P.P.Moreno 13737 (MO). Panama Chiriquí: 1200 m, 8.42N 82.14W, 15 June 1984, H.W. Churchill 5443 (MO). Bolivia Cochabamba: 2200 m, 17.47S 64.41W, 16 Octubre 1996, M. Kessler et al. 9076 (MO). Bolivia La Paz: 14.23S 68.28W, 19 July 1993, Kessler 4055 (LPB, MO). Bolivia La Paz: 2286-2499 m, 16.20S 67.32W, 17-18 May 1990, Luteyn & Dorr 13716 (MO). Bolivia La Paz: Yungas, 1800 m, 16.05S 68.03W, 18 December 1982, J.C. Solomon 9168 (MO). Bolivia La Paz: Yungas, 1400 m, 16.05S 68.03W, 21 April 1982, James C. Solomon 7481 (MO). Bolivia La Paz: 2500 m,, 1 Jan. 1994, Beck 21287 (LPB, MO). Bolivia La Paz: 1500 m, 15.40S 067.29W, 25 Agosto 1997, M. Kessler et al. 11431 (MO). Bolivia La Paz: 1050 m, 15.02S 68.29W, 9 Junio 1997, M. Kessler, J. Gonzales, K. Bach & A. Acebey 9953 (MO). Bolivia Santa Cruz: 2000-2500 m, 17.48S 64.15W, 6 June 1992, Killeen & Vargas 4085 (MO). Brazil Espirito Santo: Mpio. Alfredo Chaves, 1040 m, 20.24S 40.44W, 31 July 1986, Croat 61870 (MO). Brazil Minas Gerais:, 19 May 1993, Lombardi & Colido 250 (MO). Brazil Minas Gerais:, 3/5/1980, Tales & Grandi 180 (MO). Brazil Sao Paulo:, 7 Oct 1980, Forero et al. 8600 (COL). Colombia Antioquia: 2280 m, 05.59N 76.07W, 29 September 1987, James L. Zarucchi, Alan E. Brant, & Julio Betancur 5952 (MO). Colombia Antioquia: 1840 m, 6.17N 75.08W, 4 December 1986, James L. Zarucchi 4409 (COL, MO). Colombia Antioquia: 1000 m, 06.18N 75.02W, 26 October 1987, Alan E. Brant & Fco. Javier Roldán 1510 (COL, MO). Colombia Antioquia: Río Cuevas, 1800-2000 m,, 16 Mar 1984, Sánchez et al. 76 (COL, MEDEL). Colombia Antioquia: 1640 - 1530 m,, 27 Sept. 1988, Betancur et al. 733 (COL). Colombia Choco:, 13 May 1984, Cordoba & Garcia 263 (COL). Colombia Choco: Río Torito, 630 m,, 23 Mar. 1980, Forero et al. 7585 (COL). Colombia Cundinamarca: Cordillera Oriental, 2300 m,, 25 July 1981, Jaramillo, R. et al. 7068 (COL). Colombia Risaralda:, 29 Nov. 1989, Silverstone-Sopkin et al. 5785 (MO). Colombia Risaralda: 970 m, 04.50N 75.53W, 30 Dic 1994, P. Silverstone-Sopkin & Néstor Paz 7251 (MO). Colombia Santander: 1820 m,, 11 May 1982, Rodriguez, J. & E. Rojas 5 (COL). Colombia Valle del Cauca: 1650 m,, 6 September 1992, Gamboa, M. 123 (MO). Colombia Valle del Cauca: 2050 - 2200 m,, 21 Jan. 1983, Diaz, S. 3850 (COL). Ecuador : Cerro Antisana, 6500 ft, 00.30S 78.00W, 12 Aug 1960, Grubb et al. 1258 (K, NY, Q). Ecuador : Santiago-Zamora, 900 m,, 19 Mar 1956, Asplund 19834 (G, NY, S). Ecuador Azuay: Río Patul, 640 m,, 31 May 1943, Steyermark 52795 (NY, US). Ecuador Bolívar: 400 m, 2.06S 79.10W, 29 Sept. 1995, Cornejo, X. & C. Bonifaz 4519 (GUAY, MO ). Ecuador Carchí: Maldonado, 1500 m,, 19 Feb 1986, Christenson 1230 (MO). Ecuador Cotopaxi: 700 m, 00.55S 79.11W, 05 Mar 1973, L.B. Holm-Nielsen et al. 2973 (AAU, COL, F, GB). Ecuador Guayas: 350-400 m, 01.46S 80.41W, 8 Junio 1994, X. Cornejo, C. Bonifaz 2845 (GUAY, MO ). Ecuador Guayas: 110 m, 1.44S 80.45W, 02 Apr. 1994, Cornejo, X. & C. Bonifaz 2270 (GUAY, MO ). Ecuador Loja: 1400 m,, 20 Feb 1985, Harling & Andersson 22324 (GB). Ecuador Los Ríos: Río Palenque Biological Station, 220 m, 00.35S 79.22W, 16 Sep 1973, Dodson & Tan 5343 (RPSC, SEL, US). Ecuador Manabi: 375 m, 01.02S 80.37W, 13 Oct 1995, X. Cornejo 4643 (GUAY, MO ). Ecuador Manabi: Pata, 300-700 m, 00.01N 79.58W, 21 June 1996, John L. Clark et al. 2723 .
cuador Napo: Sumaco, 1100 m, 00.43S 77.36W, 17 Dec 1988, Fernando Hurtado 1210 (MO). Ecuador Pichincha: 1800-2000 m, 00.02N 78.03W, 19 Jan 1989, Fernando Hurtado, C. Cerón, J. Regalado 1438 (MO). Ecuador Pichincha: Parroquia Nanegal, 1540 m, 0.05N 78.38.5W, 07 Sep 1993, Webster et al. 30410 (DAV). Ecuador Sucumbios: 1800 m, 00.03N 77.35W, 23 May 1990, Carlos E. Cerón & J. Ayala 9862 (MO). Ecuador Tungurahua:, 05 Apr 1933, Heinrichs 873 (NY). Ecuador Tungurahua: Montaña Woma, 1900 m, 01.23S 78.22W, 03 Jun 1968, L.B. Holm-Nielsen & S. Jeppesen 301 (AAU, NY). Ecuador Zamora-Chinchipe: Río Bombuscara, 900 m,, 17 May 1967, Sparre 16390 (S). Ecuador Zamora-Chinchipe: 1100 m,, 12 Apr 1985, Harling & Andersson 24036 (GB). French Guiana : 650 m, 03.33N 53.55W, 16 Jan 1989, Granville et al. 10712 (MO). Peru Amazonas: 2150-2200 m, 05.40S 77.22W, 2 June 1986, Sandra Knapp, P. Alcorn, J. Mallet & H. Esley 7529 (MO). Peru Amazonas: Dist. Sipabamba, 1300 m,, 5 May 1981, Young & Eisenberg 324 (MO). Peru Amazonas: 2550 m,, 27 March 1998, Henk van der Werff, B. Gray, R. Vasquez & R. Rojas 15836 (MO). Peru Pasco: 2080 m, 10.36S 75.33W, 19 Nov 1982, D. N. Smith 2712 (MO). Peru Pasco: 1200 m, 10.45S 74.23W, 21 Sep 1983, D. N. Smith 5105 (MO). Peru Tumbes: Matapalo, 650 m,, 23 Enero 1995, Camilo Díaz, H. Osores, R. Figari, D. Díaz, D. Castañeda y A. Peña 7486 (MO). Venezuela Amazonas: 1500-1760 m, 05.41N 66.10W, 4 March 1987, Ronald Liesner & Bruce Holst 21613 (MO). Venezuela Trujillo: Distrito Carache, 2200 m, 9.36N 70.9W, 1 Nov 1987, Rivero & Diaz 1364 (FLAS, NY). Venezuela Yaracuy: 1200-1350 m, 10.12N 68.35O, 27 Abril 1994, Meier, Winfried et al 3921 (MO). Venezuela Yaracuy: 1200-1300 m,, 23 Abril 1994, Meier, Winfried et al 3958 (MO). Caribbean Dominican Republic: 200 m, 18.58N 69.28W, 14 June 1988, Thomas B. Croat 68492 (MO). Caribbean Dominican Republic: Cordillera Central, 1100 m, 19.15N 71.18W, 1 Dec. 1989, Zanoni et al. 43948 (MO).